Yes the site is still ugly. I hope it won’t be for long. I’m going to be doing a bit of work on the template tonight, so things are going to get a bit wonky for a bit. There is no need to panic. If you get a bit scared, please look at this picture of Stephen Colbert with a puppy. Thank you. 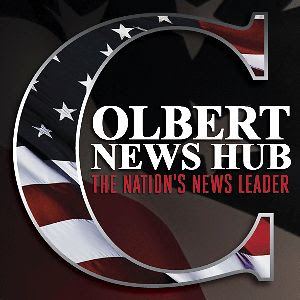 Poll: Where do you go in the Colbert Nation to talk to other fans? Yes, the site is ugly. Yes, I plan to fix it. We’ll get back on track with episode guides and Colbert newsy goodness here very soon, but until then, please enjoy this lovely piece of eye candy, taken by last night’s guest Dan Sinker and published via his Twitter Feed. Also, apparently Elvis the dog rules. Okay, this has absolutely nothing to do with Stephen Colbert whatsoever, but I’m blogging this from my Macbook Air at Baylor Medical emergency room. Minor emergency apparently. It’s the almost end of a great date night gone horribly awry. I’m fine, but hubby won’t be roller skating for a while.